PHOENIX – The Southern Baptist Convention’s annual meeting drew 5,018 messengers to Phoenix June 13-14. The unofficial total is 31.6 percent fewer than last year’s 7,321 messengers in St. Louis but 164 more than 2011 when the convention last met in Phoenix. Missouri was the seventh largest delegation, bringing 242 messengers. 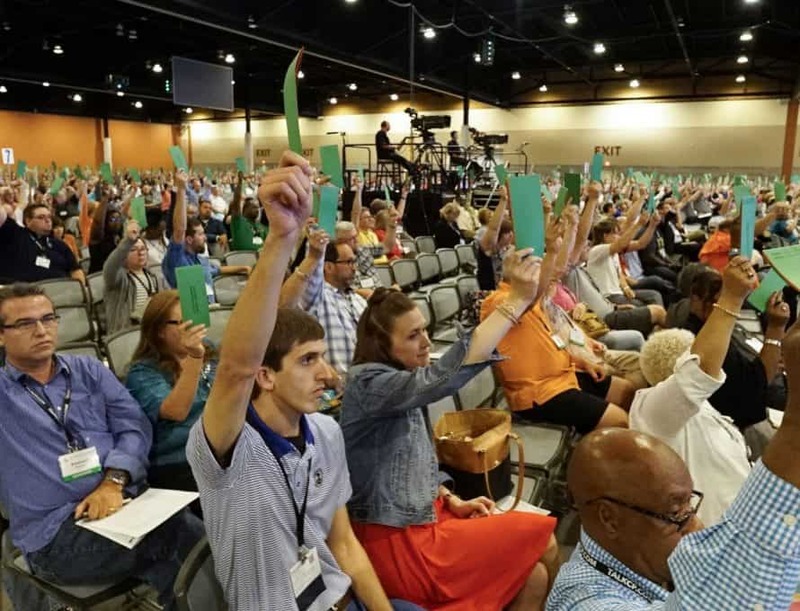 As expected, Arizona Baptist churches turned out for their host-meeting; their 374-messenger total was the second largest of the state delegations. Texas was the highest at 474 messengers. When registered guests, exhibitors and others are included, the count of those at the SBC annual meeting rose to 9,318. The unofficial state-by-state messenger registration numbers are as follows: Alaska, 17; Alabama, 234; Arkansas, 175; Arizona, 374; California, 283; Colorado, 48; Connecticut, 2; Washington, D.C., 11; Delaware, 4; Florida, 266; Georgia, 303; Hawaii, 16; Iowa, 12; Idaho, 6; Illinois, 98; Indiana, 55; Kansas, 51; Kentucky, 240; Louisiana, 187; Massachusetts, 10; Maryland, 7; Michigan, 28; Minnesota, 7; Missouri, 242; Mississippi, 141; Montana, 11; North Carolina, 316; Nebraska, 4; New Hampshire, 2; New Jersey, 19; New Mexico, 92; Nevada, 75; New York, 30; Ohio, 77; Oklahoma, 135; Oregon, 12; Pennsylvania, 22; Puerto Rico, 1; South Carolina, 191; South Dakota, 11; Tennessee, 373; Texas, 474; Utah, 21; Virginia, 176; Vermont, 5; Washington, 41; Wisconsin, 15; West Virginia 23; Wyoming, 9. There were 21 messengers who were approved through the credentials process but were unaffiliated with a state convention. Official attendance numbers will be released later in June.